Like many sac State students, I am new to bike riding. I just moved here and bought a bike to use as transportation to and from school. What I did not realize is that riding your bike is very similar with regards to traffic laws. I also did not know how to properly conduct myself as a bicyclist or as a walker on the American River Parkway. I asked some questions of Tyler Newell, Bike Shop Manager and Lead Bicycle Mechanic, in hopes of learning a bit more about the world of bike riding in Sacramento. It is important to be courteous as a rider (and in life :) using lights and bells will not only increase your safety, but is considerate for other riders. Be aware of other riders and make moves that others can anticipate. When riding on the American River Parkway, stay in the right lane. But if you are walking, you should walk in the lane that is facing traffic, so that you can see the cyclists coming. If you decide to ride on the streets, make sure you are comfortable riding in traffic. A bicyclist should obey all the standard traffic laws as if they were driving a car. Make sure to signal; this shows your intentions to other riders and drivers. Wearing a helmet is not required for persons over the age of 18, but it is always highly recommended. There are also items you can purchase to enhance your biking experience and increase your safety. 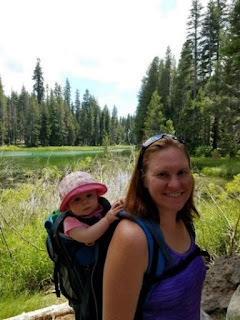 I personally have purchased many items from Peak Adventures that have contributed to the overall enjoyment of my rides and I am going to recommend three “must have’s,” in my opinion. The first is directed towards beach cruiser bikes and it is the front basket. Not only does it look good, but I can put my music in it, my purse and any other smaller items. The second is a rear flat rack. This allows you to put those bulkier items (i.e. backpack) on the back of your bike, freeing up your back for a more enjoyable ride. You won’t get as sweaty in the summer months and it is aesthetically pleasing. This is also safer because you have the freedom to move around. Along with the rear flat rack, I purchased panniers. These are like saddlebags for your bike. Many people opt for the milk crate/bungee cord system for their flat rack. Tyler explained to me that not only could I seal up my items in this bag, go to the grocery store and carry home more items, and it was hard to remove (deters theft), but it also had rear reflectors and was water resistant. This was a no brainer for me; “Let’s do it” was my response. I hope this blog has increased your awareness of bike riding etiquette and available accessories. As I mentioned above, I am a novice. Luckily I can rely on Peak Adventures, where there are many years of experience among the staff. If I ever have a question about my bike, or biking in general, I know where to go. 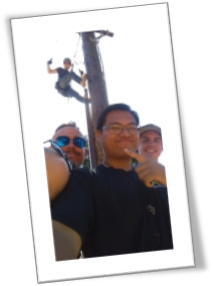 Peak Adventures specializes in serving students at Sac State as well as the community of Sacramento. The staff is knowledgeable, friendly, and talkative! They are always willing to answer any question or just “talk shop”. This is a great resource for anyone who would like to learn more about the benefits of biking. Don’t forget…free chain lube everyday at Peak Adventures! Filing for bankruptcy is a big step. But, it can be just what you need to do. Or, maybe, it's the last thing you should be considering. The mounting bracket required some extreme strength to get rid of so it may be mounted.A pleasant vibrant blue Brought allows you realize it’s brewing.